Having your pedicure done at a salon requires a lot of time and consistent amounts of money on a regular basis. However, you can achieve similar spa results in the comfort of your own home by investing in the best callus remover for heels to help remove dead skin and calluses. But, if you don’t have the time or the energy to search for such items on your own, we’ve got you covered. We’ve studied countless models and chose the ones offering the most features for the money. 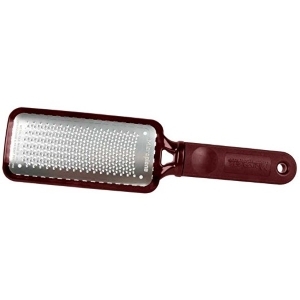 After careful comparisons, we’ve concluded that the Microplane Colossal Pedicure is the product you should consider. It comes with an ergonomic handle and a lightweight design, it features two different skin files to help you achieve the perfect pedicure, and it can be used without soaking your feet in the water at first. If the Microplane Colossal Pedicure is not available right now, you can also opt for the Colossal Foot Rasp Metal as a great alternative. Finding the right callus remover for heels is not an easy task, especially since there are so many great products for sale on the market. In order to make sure you made the right choice, here are some of the most important features you should consider when opting for the best heel callus remover. A good heel callus remover should come with a sleek and lightweight design to allow you to easily use the product whenever you want. If you are opting for a regular skin file you should first look at the handle. The handle should provide a good grip and be made of strong, durable, and lightweight materials to prevent hand fatigue, especially if you plan on using the callus remover for a long period of time. The results you are going to obtain with a regular callus remover also depend on the size of the file used. A narrow file won’t be able to cover the entire surface of your heel or foot so you’ll have to apply it to smaller parts to ensure a thorough cleaning and peeling. On the other hand, removers with narrow files tend to be lighter and easier to use if you’re looking for quick touch-ups right before an event. In addition, they can also be used to clean the back skin of your toes and other areas of your feet that might be prone to calluses. Wide feet files will cover the larger surfaces on your feet so you will be able to finish peeling faster and easier. These type of files are mainly suitable for people with wide and long feet. There are plenty of manual callus removers that work by applying force directly on the feet. However, the main concern about a manual callus remover is the quality of the file used. Keep in mind that different people might require different types of peelings, so having just one device with interchangeable accessories is a great option. Look for devices with replaceable roller heads you can easily change according to your requirements and how often you use the product. These types of callus removers are also more hygienic and safe to use in salons and spas. If you’re trying to find the right product but really have no time to read countless reviews, then we’ve got you covered. We’ve compiled a list with some of the most appreciated callus removers on the market, complete with descriptions so you can choose one that offers the features you need at an affordable price. This item is perfect for those who don’t want to hear about electronic devices that need to be charged constantly. The manual callus remover comes in three different colors so choose the one that best matches your personality. The item features a lightweight and durable handle with a soft and comfortable grip. 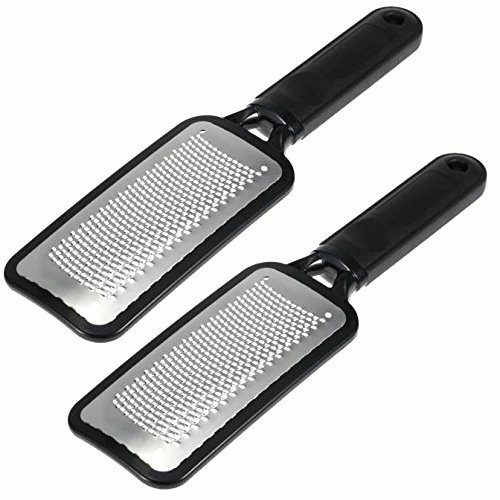 Thus, you can rest assured you will be able to use this feet file for a prolonged amount of time without suffering from hand fatigue or joint pains. What we liked the most about this product is that it features a two-sided file, each fulfilling another role. On one side you have a large file surface suitable for heavier peeling. It is specifically designed to remove more dead skin cells and calluses and provide in return a smooth and silky skin. The other side contains a lightweight file suitable for quick touch-ups before an important event or wearing a new pair of heeled sandals for the first time. 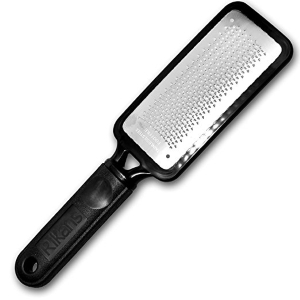 This foot file is a great solution for dry, cracked, and calloused heels. By using this product on a regular basis you will enjoy soft and smooth skin around your feet and heels without any effort. What we liked the most about this large callus remover is that it provides great results both on wet and dry skin. Thus, you can use it anywhere you are for quick touch-ups before important meetings or in the comfort of your own home, after a long and relaxing bath. The product features a large abrasive file that is great to remove calluses and dead skin cells on large feet surfaces, not only on your heels. The handle is lightweight and provides a firm and comfortable grip, so you can use the file without suffering from hand fatigue. You can apply different types of pressure when using the product, depending on the type of results you want. If you’re looking to remove thick calluses on your heels, apply firmly on the wet or dry skin. If you just want to remove dead skin cells around the foot and enjoy a smooth skin, apply the file gently. This great product is available in two different beautiful colors, red rose, and blue. 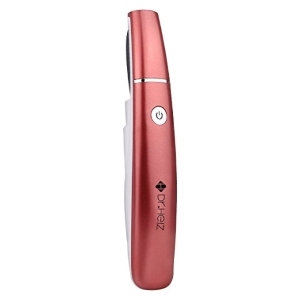 The electric callus remover features a thin, sleek, and elegant design that will help you easily get rid of dead skin cells and smoothen your skin around the feet and heels. The lightweight design is extremely portable and, due to its small dimensions, will fit even in a small purse. This means you can take the product with you anywhere you go, including on your holiday trips. The interchangeable roller heads allow you to reuse the product as many times as you want to always receive the best results. The product also comes equipped with a small LED light you can use to see even the narrowest surfaces with calluses and rough skin on your feet, for a thorough cleaning. Each package comes with a lace protective bag and a charging cable. You can charge your device directly from your laptop or from a regular power bank.